Growing chives is easy, fun and rewarding! 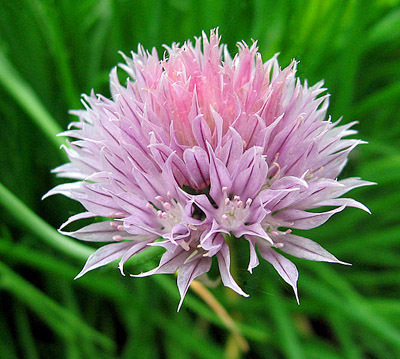 Chives are in the Allium family, which includes onions and garlic. They are used as a food, medicine and to add color to a garden. Chives are an excellent choice for permaculture gardening as they make good companion plants, act as dynamic accumulators, suppress grass, act as beneficial insect attractors and have other important uses. There are four commonly planted species of chives: common chives (Allium schoenoprasum), giant Siberian chives (Allium ledebourianum), Garlic chives (Allium tuberosum) and Siberian garlic chives (Allium nutans). All four species are edible and have different flavors. There are several easy ways to growing chives in your garden. Here are some ideas you can try. The first is to purchase starts from your local nursery. The second method is to divide from existing stands of chives from your friend or friendly neighbor. This means physically separating a clump of chives off of an existing stand. Make sure you include bulbs and roots in each clump. The third technique is to grow them from seed. Growing them from seed requires patience, as they can take up to two years to grow to full size. Don't harvest them until at least late summer of the first year. They can be started from seed indoors, just make sure they have plenty of light. The last two methods can be used to continue to perpetuate chives in your garden without added cost. Chives like mostly sunny locations with moist, well-drained soils. As the plants mature, the flowers die back to dry seed bearing pods. These can be cut and saved, to act as a future source of more plants. Keep them in a cool, dry location. Some species, especially garlic chives (Allium tuberosum) can spread fairly aggressively through self-seeding. If you want to control them, cut the flowers off as soon as you see them wilting. When growing chives, there are several ways you can increase your harvest. One method to get more growth is once the flowers start to die back, cut the entire plant down to 2 to 3 inches. This will encourage it to put out more fresh growth. After three or four years, it is helpful to divide the plants to allow them more room to grow. During the cold season, your chives may die back to the ground. Not to worry, as the underground bulbs are still alive and will produce new growth in spring. 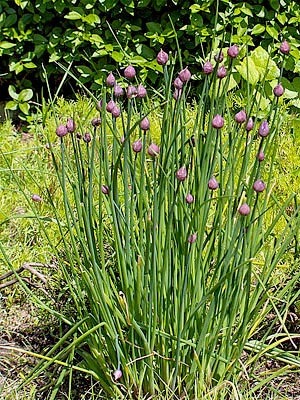 Chives are useful in a variety of ways and are an excellent addition to almost any garden. For example, the flowers attract beneficial insects to your garden, as well as repel some unwanted pests such as Japanese beetles (Popillia japonica) and other garden pests. Growing chives can also provide a splash of color. These plants also have medicinal properties similar to their relative, garlic. This includes being a mild stimulant, diuretic, antiseptic properties and are rich in vitamins A, C as well as iron and calcium. Growing chives with carrots can benefit the carrot's growth and improve their flavor. This type cooperative planting is called companion planting. To learn more about companion planting, check out our Garden Companion Planting Article. If planted in an apple grove or orchard, they can help prevent apple scab. Chive tea can also be sprayed onto cucumbers and gooseberries to prevent powdery mildew and directly onto apple trees to get rid of apple scab. Chive infusion can also be sprayed onto cabbages to repel the cabbage white butterfly(Pieris rapae). Chives can add flavor to many different kinds of foods. Many people are familiar with putting chives on baked potatoes. These wonderful little herbs can be used for much more. They make an excellent addition to salads - the flowers and the chopped greens can add some zest and spice. Chives are good on cottage cheese, in sandwiches, on practically any meat or fish, and are excellent in many soups. If added to a sauce, chives are best used towards the end so as to best retain their flavor. Chives are best fresh or frozen, because drying tends to lose much of their flavor. To learn more amazing knowledge on sustainable gardening and other permaculture skills, check out our Permaculture Courses.